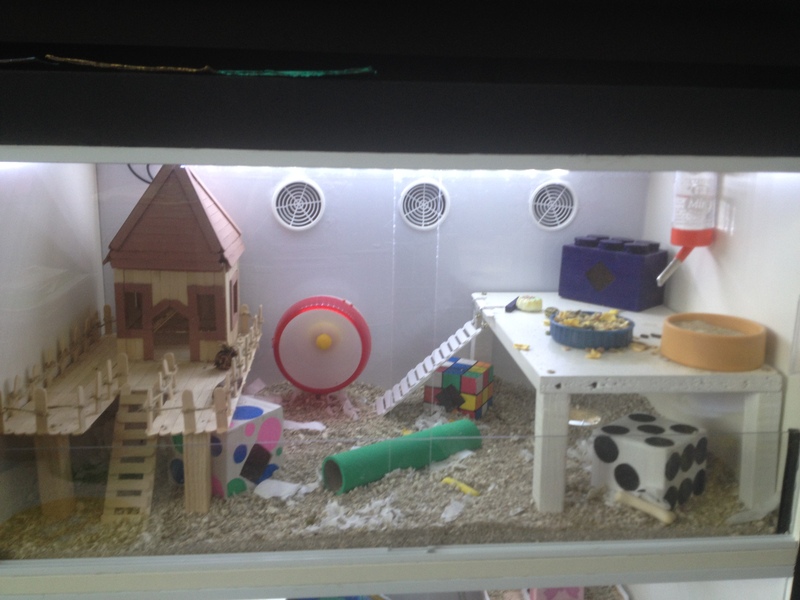 Making an amazing Ikea hamster cage a piece of furniture is a great way showcase your pet. 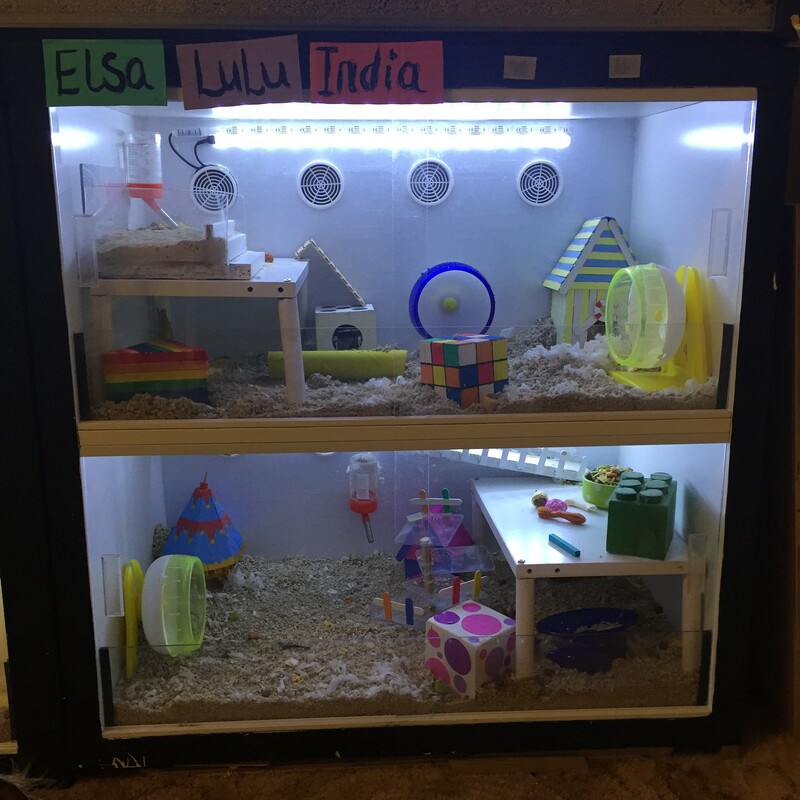 Allowing for much more space than a conventional shop bought cage, and not to mention much more interesting for both you and your hamster. These type of cages look great in a room and can be customised to match colour schemes or styles of decor. I have made my cage from an Ikea Expedit 2×2 unit (now the Ikea Kallax range). Most of the materials I have used were bought from ebay. 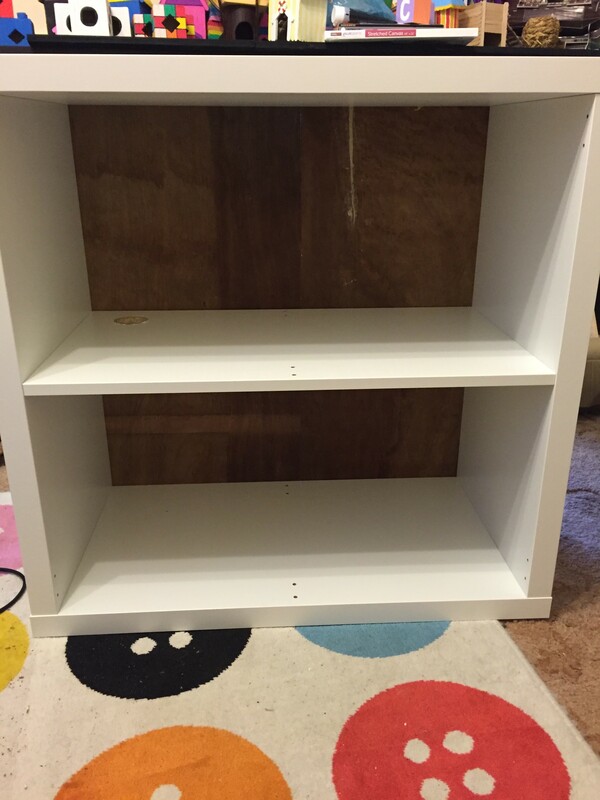 First I removed the vertical dividers. As my unit was already assembled I had to take off the top to remove them. If you are building the unit from flat pack it would just be a case of not adding these when building the unit. 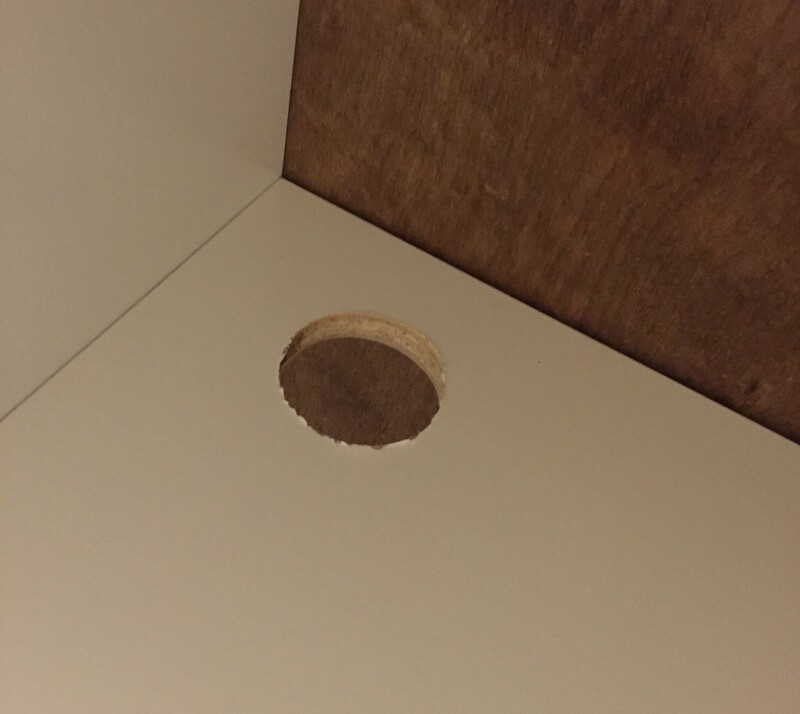 I then used a hole saw drill bit and an electric drill to cut a hole in the centre partition, this is where the access to the upstairs and downstairs will be for your hamsters. Smooth any rough edges with sandpaper. I used plywood for the back of my cage, you can use any type of wood for this or even acrylic if you preferred. Secure the back to the unit using screws. I used sticky back plastic to cover the plywood in white gloss. However you can use any colour for this depending on how you want your cage to look when its done. 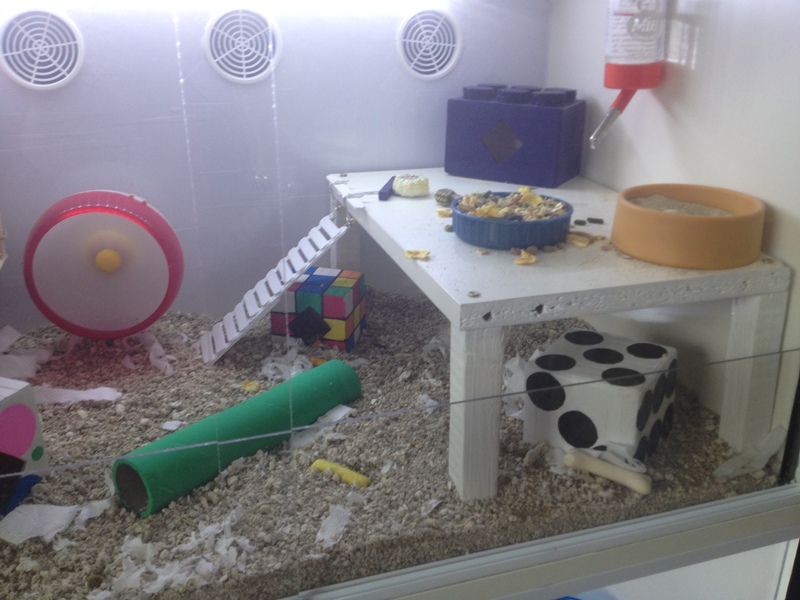 You can get so many different designs and colours, there is something for everyone, but I wanted to go for a clean, bright look for my cage. The next step is to add the air vents into the cage, make sure there are enough to have sufficient ventilation throughout the cage. I marked out the position of the vents and used a hole saw drill bit and an electric drill to cut the holes. 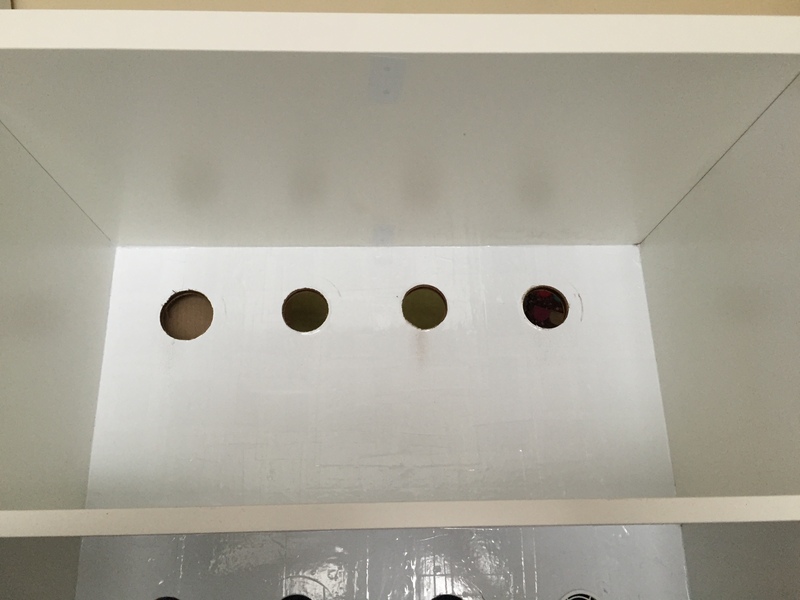 The air vents come in lots of different sizes so make sure you are cutting the holes the right size. 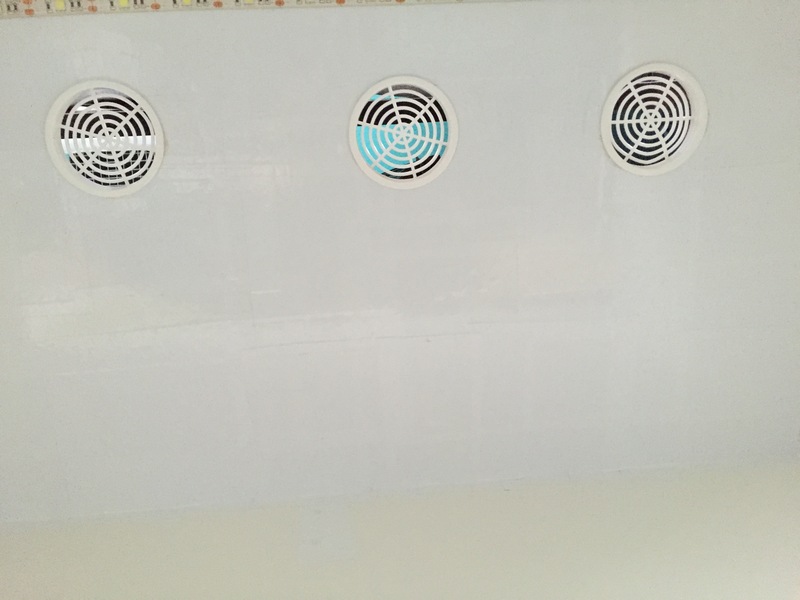 The air vents are really easy to install, they just push into the drilled holes. 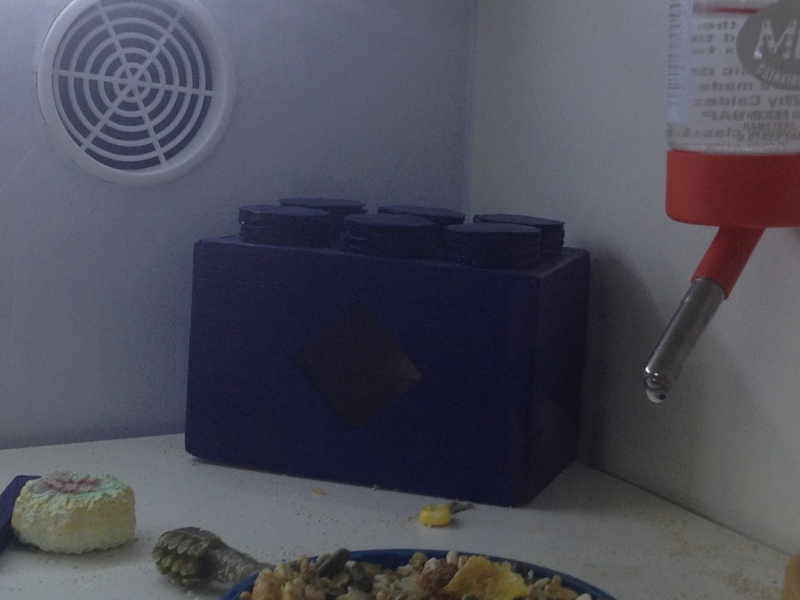 I used 4 air vents per level in my cage. 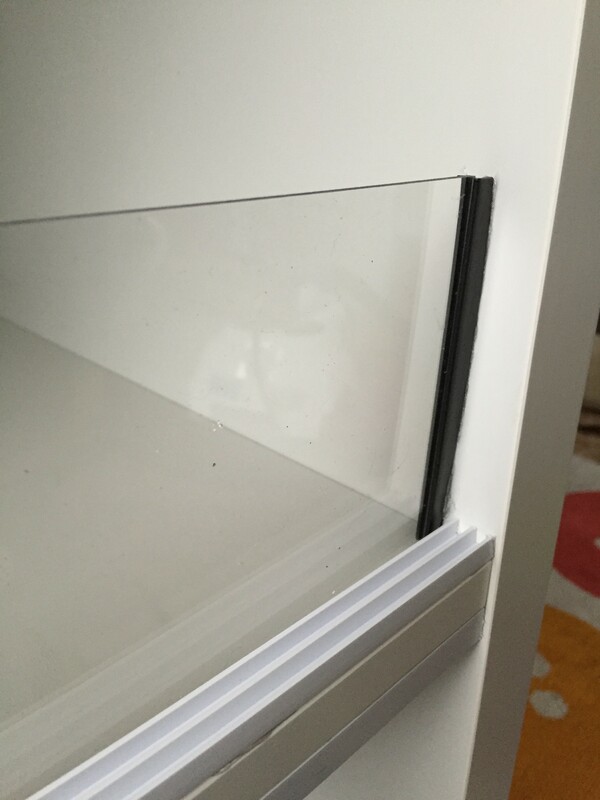 Runners need to be fitted for the acrylic doors. The PVC double U channels are really easy to cut to size using a hand saw. Just simply measure and mark the correct length and cut to size. The single U channels I have used are rubber but you can also use PVC or Aluminium ones (these were hard for me to find, so the rubber ones were my choice). I cut these to size with scissors. To secure all of the runners I used non toxic silicone sealant. The one I used is designed for aquariums, but any non toxic sealant can be used. 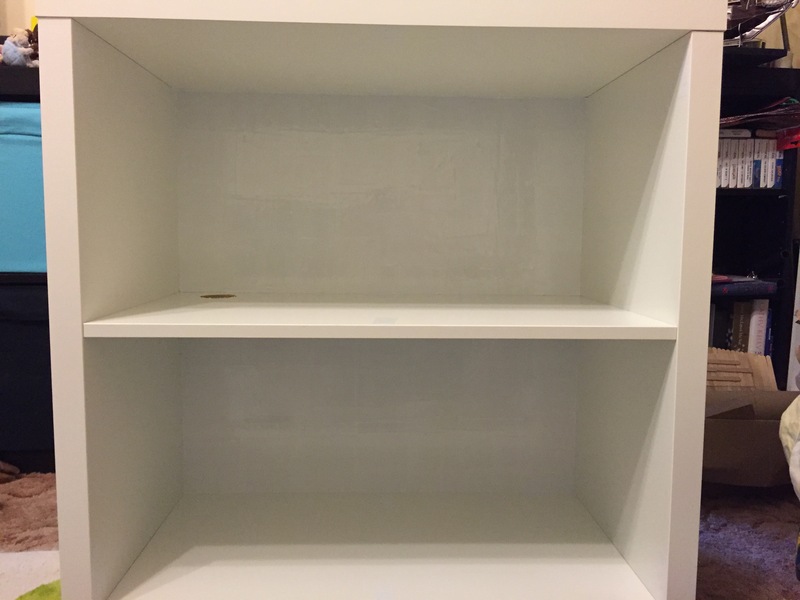 The vivarium runners need to be installed correctly, the one with the taller grooves needs to be installed on the top and the one with the flatter grooves is for the bottom. This allows the acrylic doors to be inserted and removed. 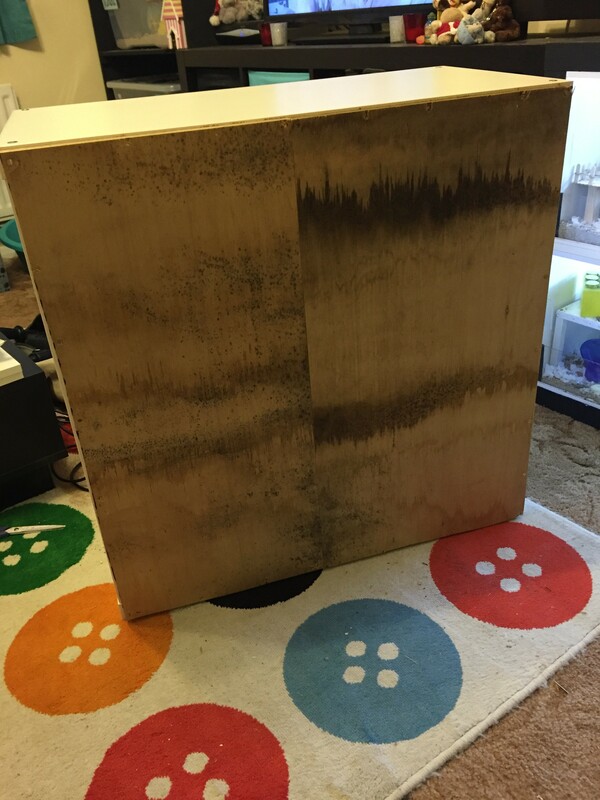 You need to make sure the sealant is properly dried before continuing with the cage, this may take 3-4 days, but make sure you follow the manufactures instructions. Order your acrylic. This can be done at a local store or via the internet. Make sure you check and double check your measurements. You need to make sure the sliding doors have a small overlap in the centre. I have an overlap of 1-1.5 inches on my sliding doors. You need 4 pieces of acrylic the same size for the doors. 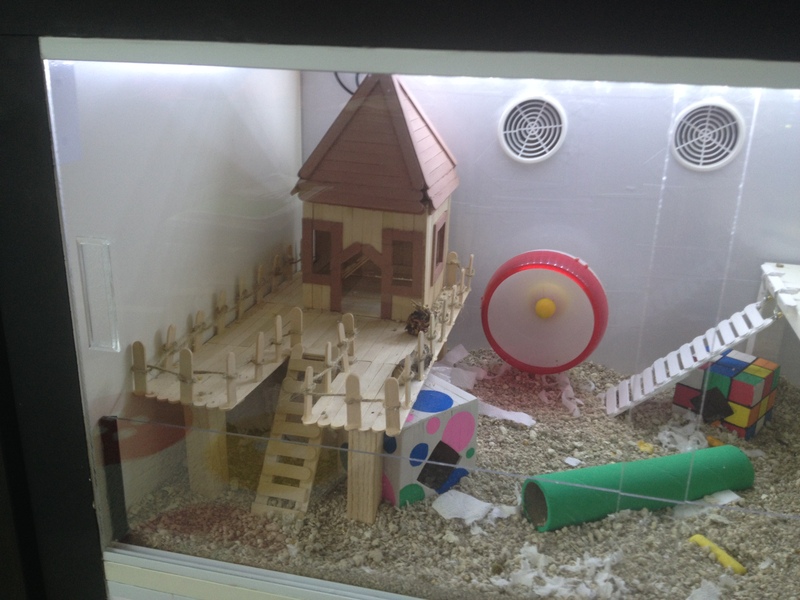 I have also added a strip of acrylic 10cm high running the entire length of the cage on both levels. This is installed behind the sliding doors so that when the doors are opened the substrate doesn’t fall out. 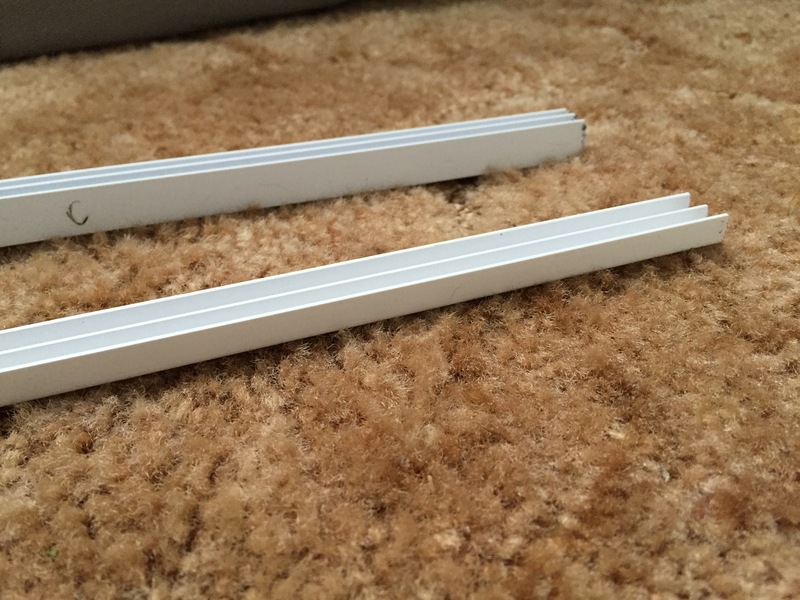 The acrylic will simply slot into the runners. All that is left to do if to add the door handles, the ones I used had adhesive on the back, so you just peel off the backing and press onto the acrylic in the correct position. 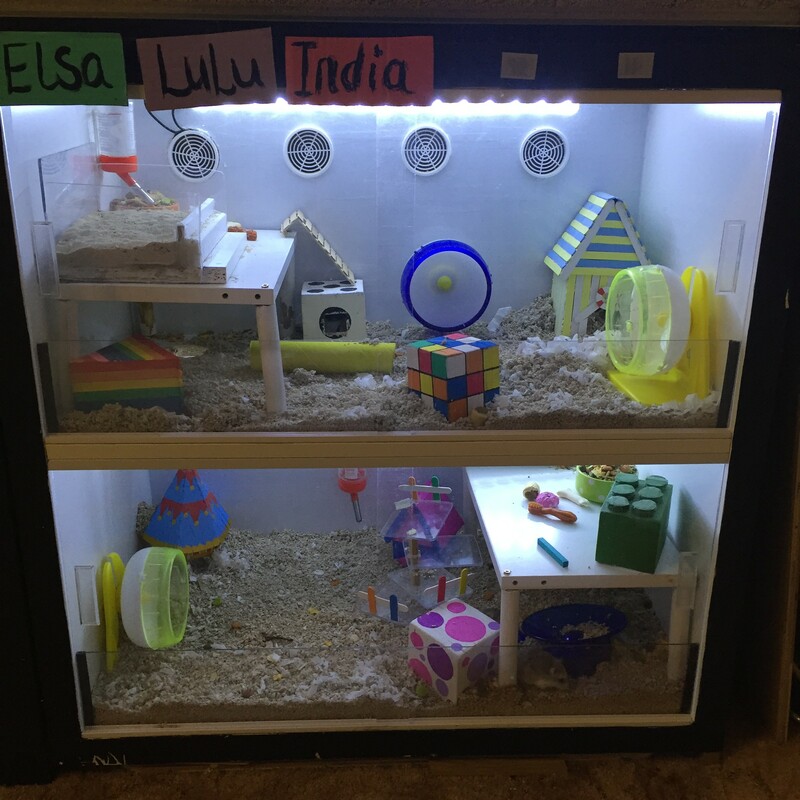 The cage is almost complete, all you need to do is add a ladder connecting the upstairs and downstairs for your hamster. 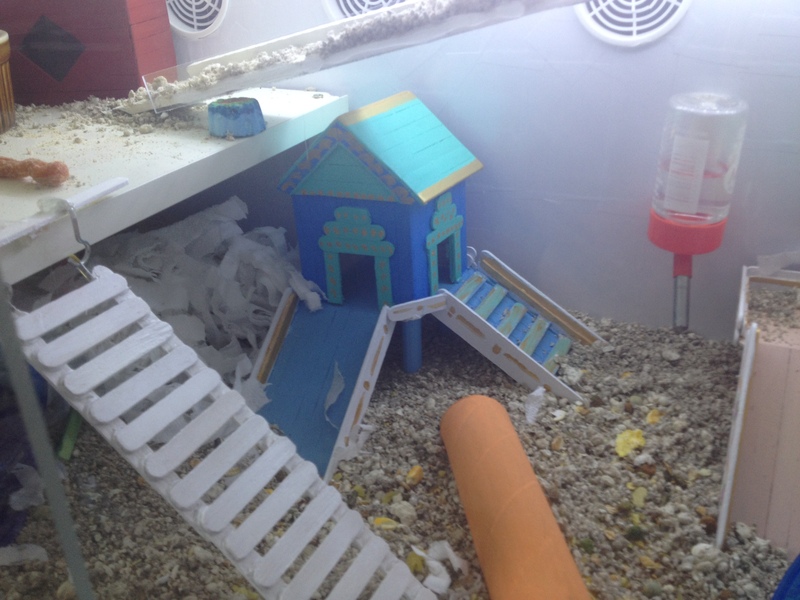 To do this I used a ladder, you can use plastic hamster tubes, but as my cage was for Roborovski hamsters I thought a ladder would be best (I didn’t want any injuries from trying to climb up or down to my hamsters legs, if you have a Syrian hamster then this wont be a problem). I made my ladder from pieces of wood which I painted white with non toxic paint. The platforms I have made from the vertical dividers that I didn’t use from the unit. I used some sanded scrap wood for the legs and made the ladders from lollipop (popsicle) sticks. I have pained the outside of the unit with black emulsion so that it matches the other furniture in the room. The water bottles I have attached using sticky back velcro. I have made all of the toys and houses from lollipop (popsicle) sticks. For some ideas and step by step instructions to make these please click here. I have added lighting to my cage using LED strip lights with a USB connection. 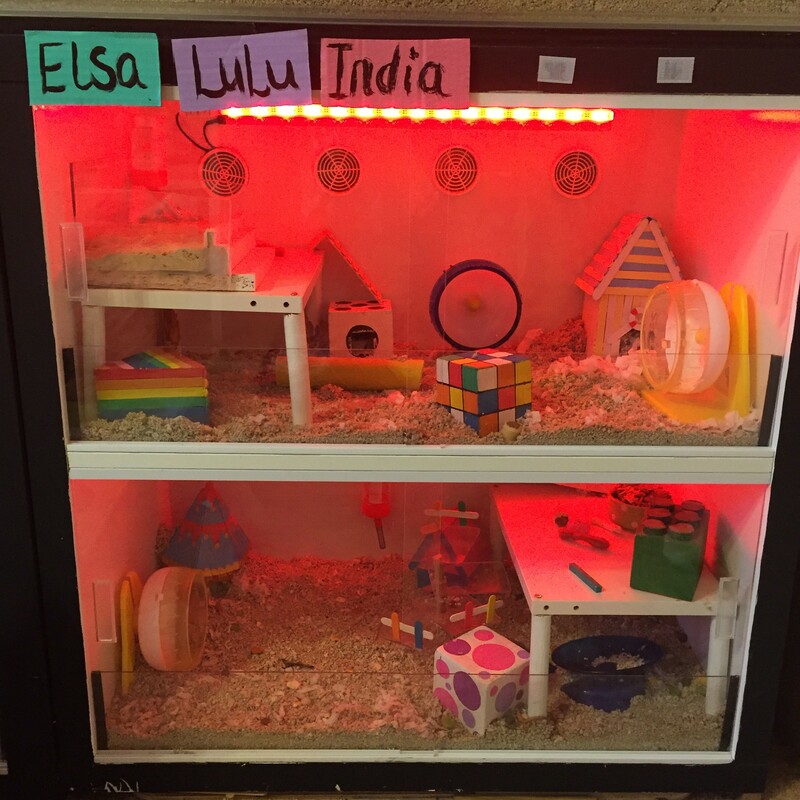 I have used white light during the day and red light for the evening (hamsters cannot see red light so this makes it deal to watch your pet without disturbing them. I made a small cut in one of the plastic air vents and threaded the strip lights through, the lights just simply stick to the back of the cage after peeling off the backing. 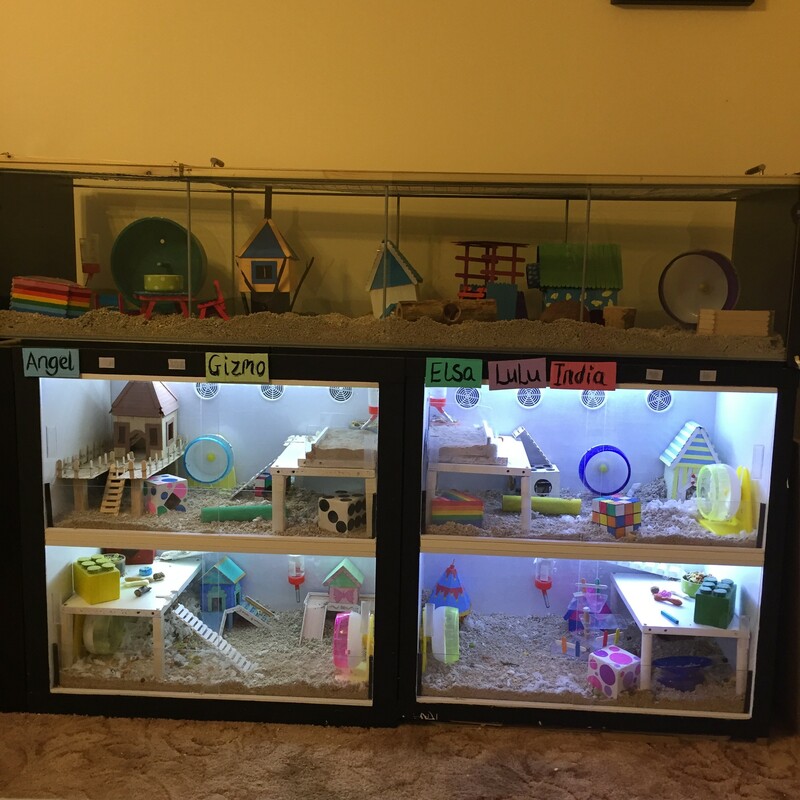 If you would like any more information about any of the toys in the cage or any other details about how I made the cage then please use the comments box or the contact me form and I will be more than happy to make more how to guides. Love this cage! How did you get your water bottles to stick to the wall btw? And how long is the cage now? I mean length x width x height?